Hand-crafted gourmet dairy products made from buffalo milk right here on our farm. We returned from a trip to Italy, the home of the famous Mozzarella Di Bufala, with a passion and a vision to produce handmade, farm fresh buffalo cheese. We bought our first 11 buffalo from Victoria & moved from Sydney to Eungai Creek. Our products have been available at local Farmers Markets along the Mid North Coast of NSW since 2012. This is where our contented buffalo graze and wander. The lush green pastures of our farm. We welcome you to visit us at the Cafe, sample our menu and meet the 'girls'. Or say 'hello' at one of the markets we attend each month to get a taste of our home grown products. Our products are available from our Cafe or from one of the markets we visit throughout each month. Our milk range includes Buffalo Feta, Persian feta, Halloumi, Gelato & Yoghurt. Our meat range includes steak, sausages & mince. We also welcome your wholesale enquiries. 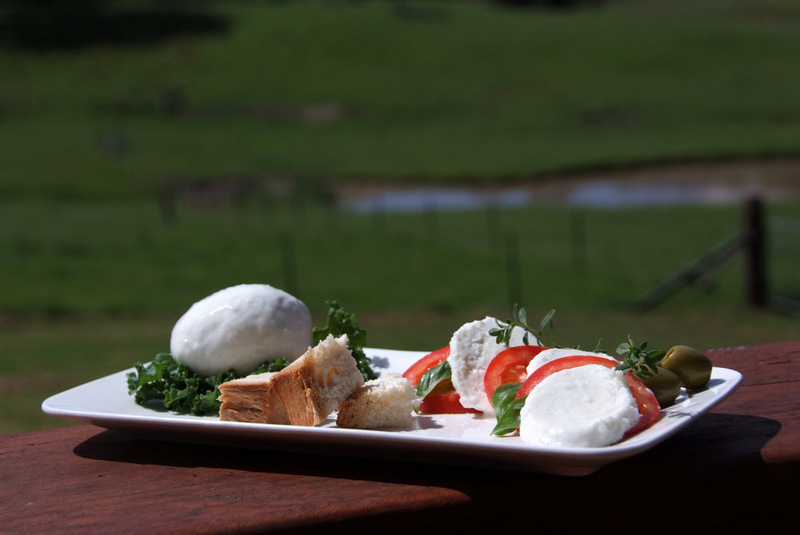 Set above the undulating farmland & lush paddocks our Cafe is now open. Inspired by our many buffalo products our menu will delight. Enjoy fresh, local produce or bring the kids for the creamiest milkshakes. Friday & Saturday nights are pizza nights - delicious pizza straight from the wood fired oven. Visit us at one of the many markets we attend across the Mid North Coast of NSW. You can sample our range of cheese, gelato, yoghurt & buffalo pies or collect your meat order. Look out for our stall. Or Contact Us with your questions or to find out more.